I did finally give away Stars A Lot - the quilt I made for my friends here in Poland! It wasn't a surprise present as I first had asked Jolie (the wife) if she wanted a quilt made by me - and she had said "Yes!" Side note: I no longer assume anyone actually wants a quilt. I've been told that the younger generation doesn't necessarily want them - preferring either blankets or duvet covers, or whatever. I don't want to spend a lot of time on something that the other person doesn't want . There would have been absolutely no hard feelings if she had said, "No thank you". However, she didn't! When Jolie told me she liked bright and cheery because our days are often dull here in Poland, I figured I could do that! And I understood. Our winter days are often cloud covered and gray. The finished quilt is featured in a blog post here if you didn't see it as I was working on it. They stopped by on their way home from their church services on Sunday afternoon and picked it up! They are also missionaries, but they work in the center of Warsaw whereas we are in a town called Otwock. Then, later, I got some very sweet messages saying thank you and yes, it was large enough for their California King size bed - plenty big! Jolie also sent me pictures showing how exactly big it was - which she said she appreciated as comforters or bedspreads she buys are often skimpy even if they say they will fit a CA King. Well, this one started out 110"x125" before quilting and washing, so it was BIG. You see here that there is plenty of room on the sides of the bed, so that makes me happy! My husband and I know we don't like quilts that don't properly fit once two people are under the covers! A couple of days after I gave it to her I got another sweet note saying that she noticed there are hearts on it! She went on to say that she loves hearts because her birthday is the day after Valentine's Day! I didn't remember hearts on it, to tell you the truth! Win, Win!. No, I didn't know that. And that made me happy! Another side note: I don't usually get this kind of feedback. I rarely if ever have the opportunity to see charity quilts in use and even when I've gifted quilts to family or friends, I've not seen them on their beds. I did, however, see my mom using the one I made her out of dad's shirts (summer, 2015) during the day as she was taking a nap. That was special. Then, the other day we went to a store called Castorama - a home repair type shop like Home Depot or Lowe's and I went around looking for things I could use, once again, in my sewing room. The rotary cutter is A 4 size or approximately the size of a piece of paper. It's cost in USD is $4.40. The cutter is $2.93 and the 5 blades were $2.93 for all 5. I found three things - one thing I hadn't noticed for sale there before. I found a rotary cutter, a set of blades, and a cutting mat! Yes, a cutting mat! Yes, it's small, but it's one nonetheless! And the cost wasn't much. 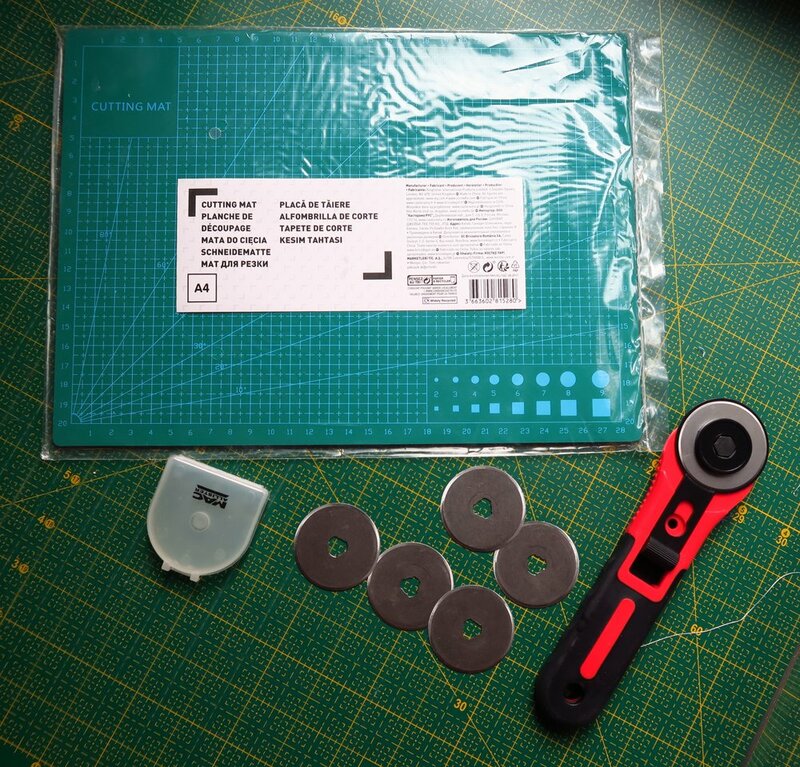 Now I already know that the quality of this rotary cutter is not the same as my Fiskars - and I am somewhat partial to a 60 mm one - so it isn't as big as the ones I prefer, but it's here and we can get it! But I think I'll put it in my sewing room and use the blades that came with it and see how it goes. And oh yes, it was while I was wandering out Castorama when I got the text with a thank you from my friend, Jolie, and pictures of it the quilt on her bed on my phone - so I'm sure anyone watching wondered why this woman was shopping in a home repair store with this weird smile on her face! And don't forget, if you need fabric for your current project, be sure to check out what my sis has for you before you check elsewhere! You will glad you did!